We want to give each bird their own little paradise. No entertaining or performing on command. We offer the choice to live cage free, and the chance to fly. Our passion is to allow them to be the unique and magnificent creatures that they are. To let them be themselves and explore in a safe environment. Our mission is to make this their last home. No bird will be bought or sold. We believe Macaws are best with other macaws. 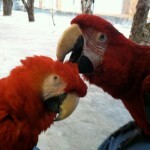 We will work with any parrot owner to find and be the final home.